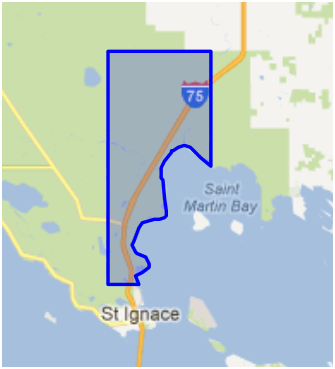 St. Ignace Township is located in the Eastern Upper Peninsula of Michigan, in Mackinac County. It consists of approximately 97 square miles of land and 45 square miles of water, with a population of approximately 1000 people. NOTICE: The St. Ignace Township Hall is only open for meetings and elections, not on a daily basis. Please see the Township Officers information for a listing of the officer you would need to contact. If you need a Building Permit, you must contact the State of Michigan as the township does not have it's own Building Inspector. Contact State of MI Upper Peninsula Inspector Daniel Grochowski 906-235-2592. Appeals will not be heard at this time. If you want to vote by Absentee Ballot, you must first complete and return a MI Absent Voter Ballot Application. An online application can be found on the following State of Michigan's website link. Once the application is complete and signed, please send to St. Ignace Township Clerk, P.O. Box 233, St. Ignace, MI 49781. You can also drop off the application to the St. Ignace Township Clerk, Sheri Oja, at 2980 Mackinac Trail, St. Ignace, MI 49781. A ballot will be mailed to you once the application is received by the Clerk and your voter registration is confirmed. Attention Veterans! Michigan has made it possible for 100% permanently disabled veterans to be exempt from homestead property taxes. If you are a disabled veteran and a resident of St. Ignace Township, please contact the Mackinac County VFW representative located at the Mackinac County Annex Building, 100 S. Marley, St. Ignace, MI. Office hours are Tuesdays and Thursdays from 8:00 am to 4:00 p.m. For questions call Luis Perez, Veterans Service Counselor at 906-643-9411 or cell 906-430-5310.